A friend of mine had a birthday recently. 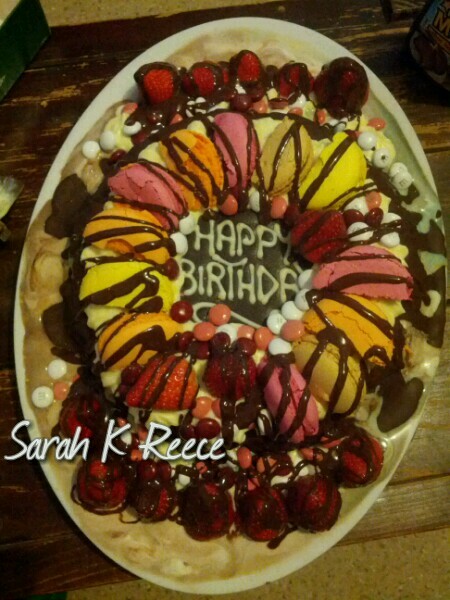 Rose and I made her an ice cream cake. It’s not too difficult, provided you don’t try to make it in 42C weather, so consider yourself warned! We bought a nice quality vanilla ice cream, let it get a bit soft, then mashed treats into it. We went for chopped jelly lollies (they freeze into little rocks so be sure to chop them), peanut M&Ms, and chopped raspberry licorice logs filled with chocolate. We swirled some chocolate fudge sauce through it, and mixed up a second lot with ground cardamom and cinnamon, chopped Turkish delight, and flaked almonds. Then we poured it into a big basin and froze it overnight. 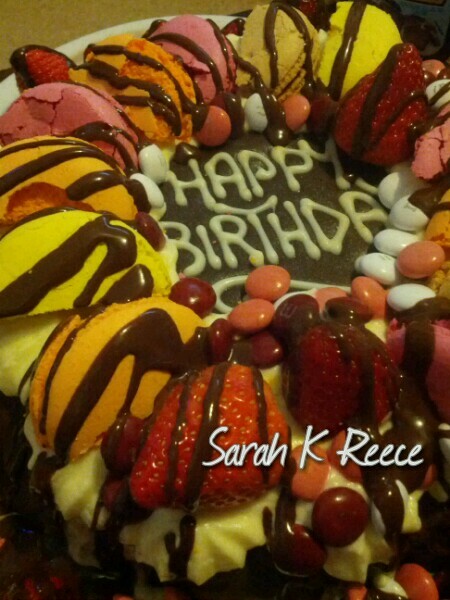 The next day I tipped it onto a plate and decorated it with fresh whipped cream, strawberries, raspberry M&Ms, a chocolate ‘Happy Birthday’ disc, and halved fruit flavoured macaroons. Everything is glued to the ice cream using a chocolate sauce.